A common question that arises from many new parents after they bring their baby home is, “what can I do with my child and what is appropriate regarding play?” There are many ways to play and interact with your baby that can make deep, lasting memories for you while helping your child develop. 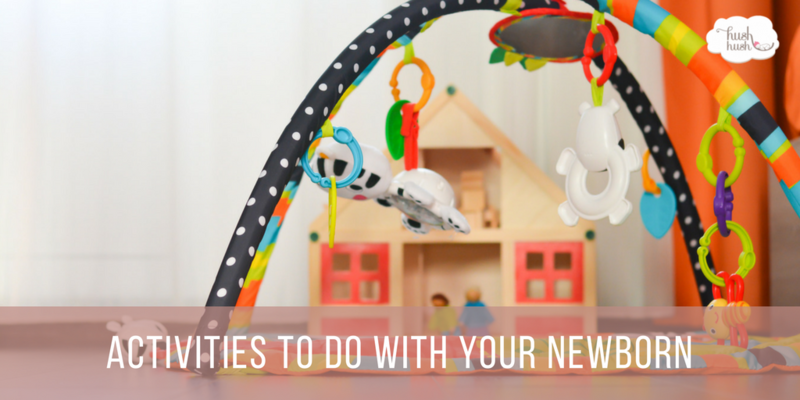 Read on for some of our ideas for newborn activities and play ideas that you can do with your little one. One of the simplest and best newborn activities is just placing your baby on their stomach for a few minutes. According to the National Institute of Health (NIH), tummy time “Helps prevent flat spots on the back of your baby’s head; makes neck and shoulder muscles stronger so your baby can start to sit up, crawl, and walk; improves your baby’s motor skills (using muscles to move and complete an action).” It is a simple activity but can make a significant difference in terms of your child’s growth and development. For newborn activities with more of a play emphasis, playmats are an excellent way to engage your baby in play. Sometimes referred to as activity gyms, playmats, are soft pads that include overhead toys (similar to the image above) that encourage your child to explore new objects. Most of these playmats have some theme such as jungle animals, undersea, or barnyard. They may also include sound or light elements so be careful not to overstimulate your child. Last but certainly not least on our list of newborn activities is to engage your baby with language through books and music. Even though your child can’t read or talk yet, the reading of books to your child can help them learn the patterns of speech and language. The repetition combined with the colorful pictures can lay the foundation for word association. Taking it a step further with singing can be the basis for a lifelong love of music. Additionally, beginning to read and sing to your baby when they are a newborn establish a tradition of reading and singing in your home.